← Watercolour American Saddlebred , golden dun …..gone a little cartoon like! I have been meaning to try out a cow in watercolour, but these hares and horses I am so keen on painting keep taking priority, or is it I just kept putting the cow off for fear of failure? Well with the heavy rain over the weekend I started my cow, putting some suggestions of paint, a few outline marks, oh and the light background wash. I left to dry, and like all my other paintings left it in eye shot so I could decide where to go next, with colour etc, and how much detail. Hindered slightly by my daughter laughing at it in its early stages, suggesting it looked more like a giraffe? That cows don’t have ears that large, and that if I added those little horn like things, I was pretty much painting a wild beast from Africa, huh!! So I left it and continued with my other painting on the go ( American Saddlebred which is now finished see previous post) . So it’s Monday evening, I need to be up early for our county show ( new forest) tired from a days work, but I need to prove my challenger wrong, so out come the paint, four hours later, and at midnight she is done. I think a lot more cow like than giraffe, I will see if I pass the test in the morning when I see her reaction? I don’t think the nose is quite right, but the problem with watercolour is there is no altering it, as I can with oil and acrylic, and I have a tendancy to overwork everything in all mediums, this was heading in that direction, so I STOPPED, here she is, the no name brown cow. 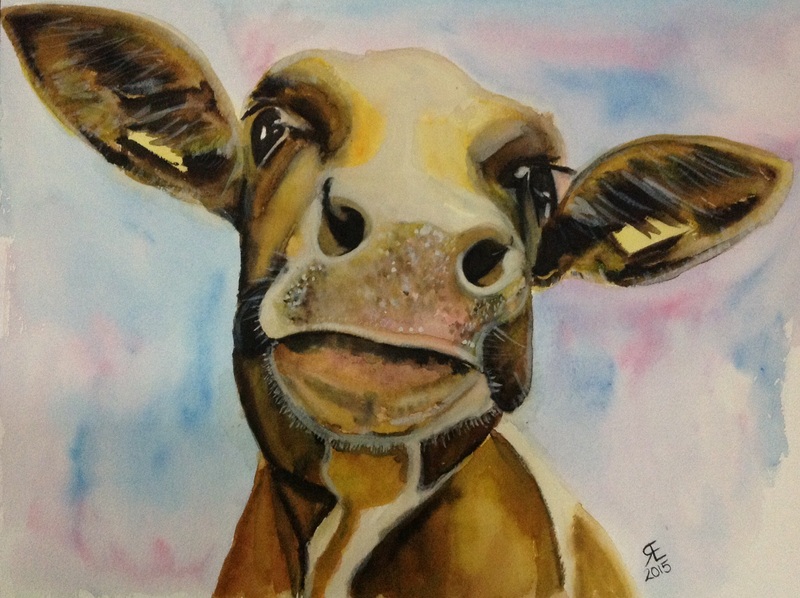 This entry was posted in art, Cow, watercolour and tagged art, Cow, painting, Painting, watercolour. Bookmark the permalink. Thank you, I will tell my daughter….she still says giraffe, teenagers will argue over anything, and sometimes nothing!